Earth Girls is the first collection from a poet well known to readers of small magazines and anthologies in the UK and Australia, and to aficionados of poetry prizes. 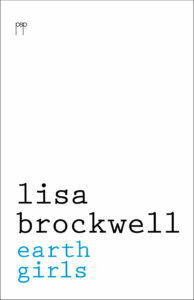 In recent years Lisa Brockwell’s work has been published in the Spectator, Eureka Street, Snakeskin, Best Australian Poems 2014 and Australian Love Poems. Individual poems have been shortlisted for the Newcastle, Bridport, ACU, Byron Bay, Montreal and University of Canberra prizes. Her growing fan club have been waiting with increasing impatience for her first collection, and here it is. Some of the poems are available to read online at Eureka Street. Earth Girls was launched by Laura Bloom at Gleebooks in Sydney on Sunday 1st May 2016. Brockwell is a masterful poet in the making, and her bold in-your face approach is refreshing. She is not afraid to display her vulnerabilities as well as her strengths. She does so without ever being precious and/or self indulgent. Australia has always produced talented women poets and we should celebrate that. Dorothy Porter may be her heroine, but Brockwell is poised to go further. Strong metaphors and striking imagery make this a rewarding read. Lisa Brockwell was born in Sydney, spent a large chunk of her adult life in England, and now lives on a rural property near Byron Bay, on the north coast of New South Wales, with her husband and young son. She has worked as a communications consultant in the HIV/AIDS community sector and for the pharmaceutical industry. She has travelled extensively in Europe, North America and a bit in Asia, for business and for love. Her recent interview with ABC North Coast about Australian Love Poems can be heard on line here.